A quick look at the history of sugar indicates that its use in dessert recipes was much earlier and more common in England than most people realize. Sweetmeats and sugar-sweetened desserts of all sorts were enjoyed from the very beginning of the Medieval Era. Sugarcane is indigenous to Southeast Asia, and the earliest known production of cane sugar began in northern India, assisted by the Chinese, though the true date cannot be determined. 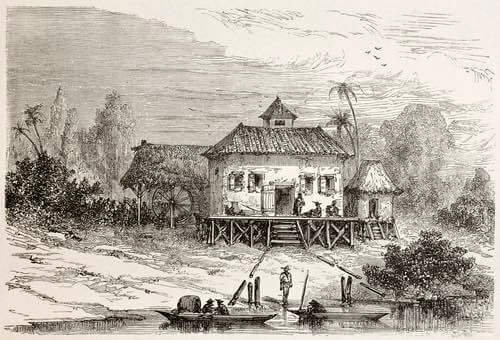 It wasn't until much later in the 15th century that sugarcane was introduced to the Americas by the European explorers. Muslim and Arab traders were shipping sugar from Asia to the Mediterranean regions by the eighth century, and Sicily and Spain became centers of sugar production by the ninth century, resulting in significant sugar exports throughout Europe and the British Isles. King Edward I used large amounts of sugar during his 1272-1307 reign, "6258 lb in 1288,"(2) and sugar imports steadily increased under later monarchs. Evidence suggests that sugar prices averaged about the same as those of common spices and remained so until well into the 1500s and the reign of Elizabeth I. Sugar's widespread availability and extensive use in this era are not generally realized. 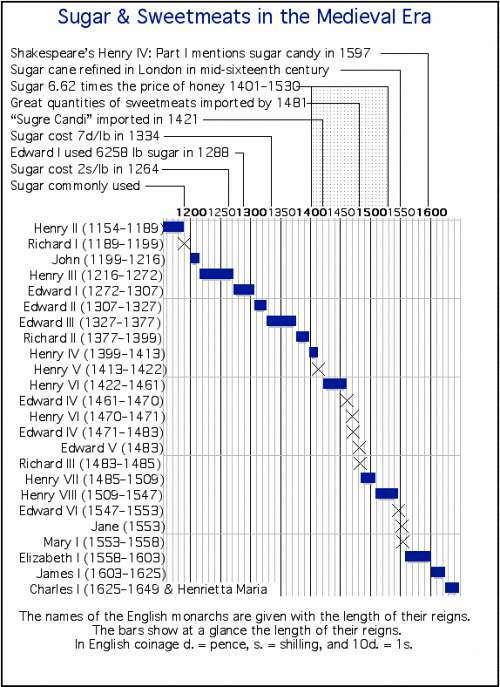 The chart below illustrates the usage of sugar and sweetmeats in England from the reign of Henry II (1154-1189) to the reign of Charles I (1625-1649). Between 1310 and 1340, a Florentine writer named Francesco di Balducci Pegolotti listed the sweetened foods commonly available in the medieval marketplace; he ticked off powdered sugars, lump sugar, basket sugar, rock candy, rose sugar, and violet sugar. There is much evidence to suggest that by the end of the fourteenth century, refined sugar was widely available in powdered form as well as in block form. Deere's expansive work, "The History of Sugar," indicates that during the fifteenth century, from 1401 to about 1530, "sugar averaged 6.62 times the price of honey. 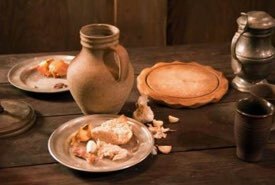 "(3) This indicates that although it was an expensive commodity for the general peasant population, it was still affordable to the era's middle classes, and it was incredibly cheap to the nobility; it saw greater use as a sweetener than honey, both in cooking and in medicines. (1) Hammond, P. W. "Food and Feast In Medieval England." Stroud, Gloucestershire, England: Alan Sutton Publishing Limited, 1993. (3) Deere, Noel. "The History of Sugar." 2 Vols., London: Chapman & Hall Ltd., 1949–50.